I don’t want to preach to the choir, especially since I’m Jewish. I want desperately to make contact with folks who don’t think the same way I do. I’m not expecting more than some initial points of connection. A spot where something might adhere, attach itself and grow. No, I’m not a virus hoping to infect unsuspecting and vulnerable adult minds. Piercing the skin or the boundaries we construct around our beliefs is an important exercise though. There’s a slogan that we “left of center” folks live by: “Think Globally, Act Locally.” This idea emerged when the first pictures of the planet earth from outer space started to appear in the media and in our consciousness. Previously, the idea of the world as a globe was conceptual and rendered by artists. Now, we (all of us), are used to looking at the photographic image of our floating blue/green marble in an ocean of black space. This vision of our planet was revolutionary because it was an image void of country, state, county, city or neighborhood property lines or boundaries. From outer space it’s just green and brown for earth, blue for ocean and white for clouds. In fact, to the rest of the universe and from the Holy One’s perspective, that is what we are, plain old inhabitants of the planet earth. We share the planet with billions of other life forms from bacteria and floras and faunas to animals and lava flows. I don’t spend a lot of time relating to my volcanic neighbors, since it can be quite dangerous and I live in the rain zone, but volcanic flows and eruptions impact my life even here. The temperature of our planet is affected by myriad interactions, few of which I can see. I can see the exhaust spewing from the tail pipe of an old beat up pick-up, or the steam coming from the pulp mill towers. I can’t see the continent-size hole in our ozone layer. I don’t have those kinds of eyes. Just because I can’t see this huge behemoth of a wound in our atmosphere doesn’t mean it isn’t there. What I see with my heart and with my eyes closed is very different than what I see with my eyes open. In my tradition there’s a prayer we are advised to say three times a day, there’s lots of those, but I’m going to focus on one of them for the sake of brevity. This prayer is called the Shema, which is a transliteration of the first Hebrew word in the prayer: Shema Yisrael Adonai Eloheynu Adonai Eh-had. All translations mangle the original, but this prayer means something like: Listen all you, who question, struggle, wrestle, or wonder, Holiness is everywhere, is ONE, the Divine is One. This radical monotheistic mantra means the Divine is everywhere and ALL CONNECTED! On top of saying this three times a day, we’re supposed to cover our eyes when we say it. 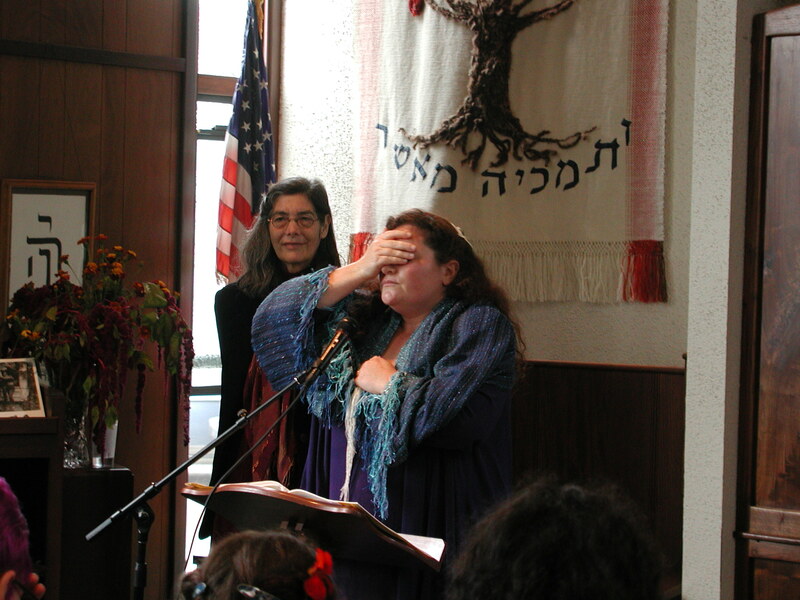 I first learned about covering my eyes when saying this prayer from Rabbi Arieh Hirschfield, of blessed memory. He talked about how with our eyes open, we see distinctions: green grass, brown chair, person wearing blue shirt and green skirt, other person who is older with glasses in black suit, carpet, window, etc…. When we close our eyes, distinctions evaporate and all is black/blank. If we additionally cover our eyes with our hands, there is no sensation of different levels of light, it’s truly dark and all is blurred into one color (black isn’t even a color, it’s the absence of color). This is the place the sages wanted us to be in, the physical sense of being without distinction or boundaries. Our physical act of actively covering our eyes is designed to help us enter the prayer and “get it” that All is One. Every time I used to fill up my 15-year-old Volvo’s gas tank, whether I did it at the Union 76 near the plaza, the Shell Station in Northtown or Cash Oil on Samoa Boulevard, I was contributing to the damaging of my environment. There is blood on my hands, no matter where I purchase my gasoline from. I do not have to pick up a gun or a knife for this to be true. I have to live with this and work for justice and change, but I cannot pretend I am innocent. I’m trying to buy from my local Arcata vendors more often than not. I’m able to do my errands, run our small business, and live my life with greater ease. I don’t ride my bike everyday to and from Bayside, I should, I should, but I don’t. I drive my car (at this point I drive a 2008 Toyota Prius) for lots of reasons, mainly so I can get all the things done I need to do in a day. I try to drive less or to combine all my errands into one outing, so I contribute less to the problems I believe are connected to our fossil fuel addiction. That relationship with fossil fuels is part of the picture in Iraq, and Iran, and all over the globe where there is violence. I’m not willing to say it is all that is going on, but it’s one of the reasons we are often in Iraq but not in Dar-fur. If we don’t have a financial connection or reason to engage with a country whose policies we dislike, we won’t often bother. When Peace becomes profitable, it will be the norm, not the exception. I hope we move towards it regardless, but I cannot control others, only myself. I shop where I live because this is where I’ve chosen to live and my need for relationship and connection to other small business owners supersedes my need to be comfortable or always at peace with their beliefs or the beliefs of those I disagree with who live here as well. I might be buying something from someone who I argued vehemently with at a city council meeting, but I will still greet that person with kindness when I see them the following day. We are living here together. This is actually something that can be multiplied out and apply to all of us on the planet. We are all living on this planet and we have to find ways to see ourselves as connected. I recognize that if it costs me a tiny bit more to buy a book at my local bookstore, Northtown Books than it does from Amazon.com. I’m contributing to my community directly when I purchase things locally and that has more value for me. Local vendors give away thousands of dollars every year for every raffle, benefit or event that school children or non-profits come up with. You will find their names on the list of benefactors always. Even when I can’t see the connections, I recognize that they are there. When I think globally and act locally I believe I am making a small difference in the cycle of destruction so many are engaged in. I treasure those who join me in this. I want to understand and reach towards those who cannot find these connection points. I don’t know that I’ve been successful in my efforts to not preach to the choir. I am verbose, overly intense at times and irrepressible (even my beloved husband says so). I hope some of this makes sense and I’m a work in progress, as is my writing. I ask for your understanding as I learn to express what is true and meaningful for me in service to the idea of being in deeper relationship with all of you. Sometimes, it’s a good idea to close our eyes and listen. We’re all sharing this space together and the more compassionate, caring and tender we are with one another, the more likely we are to live harmoniously. I’m hopeful because I choose to stop, several times a day, and remember that we are all connected and sharing this space together. This gives me hope because I know how magnificent, intelligent and lovely most of the people I come in contact with are and because even without my prayers, thanks or noticing, the sun rises and the planet spins on its axis and there is rain for my garden. May you find what binds you to your community and continue to struggle, dance and wrestle with those you may not always see eye to eye with. I promise you, it’s worth the effort and if we think before we speak and take a moment to close our eyes and listen, our engagements will be less fraught and more likely to bring about resolution and a sense of how we are all ONE. Nicole lives in Bayside, shops in Arcata, and prays all the time, everywhere.